I like this anime and wanted to make a nice wallpaper of Inuyasha perched on a cherry. That's my first wall of this anime, so I hope you'll like! it's good to see people still remember the older anime and wanting to do work of it, granted it's been rekindled but still. always a fan of your work, the brushes used here are remarkable, very fitting for the background and the piece itself, good job. I like how you changed his position and combining the two scans was a good idea cause that melancholic look on his face suits him. Not really fond of the sky, up close is a bit too blurred but as a thumbnail it looks good. Also the tree looks great on fullview. Nice job, I'm gonna use this on my desk now. The gentle, relaxing atmosphere is just so perfect. 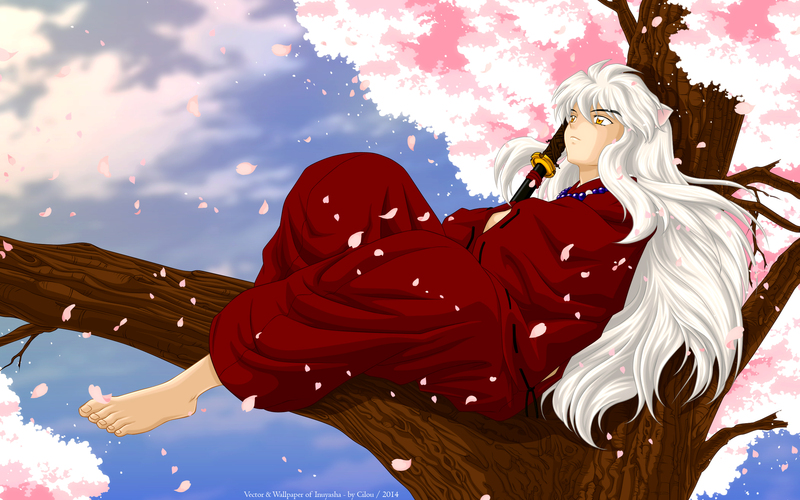 Despite InuYasha's popularity, it doesn't get enough attention from wallers. It's a lovely piece! I love the softness of it! I think you did very well to merge that scans and the cherry tree is very beautiful. Thank you for sharing another work.